Jersey City would be the equivalent of Stockton in population and density of Filipino American in the East Coast. Lot of kapit-bahay. .Last month, CBS 60 Minutes featured residents of Stockton losing their homes and repeated the current financial crisis affecting the entire nation. Stockton is a city of 280,000 people in the Central Valley; 80 miles east of San Francisco and 80 miles north of San Jose. In many ways, this is ground zero for the current financial crisis and a microcosm of everything that went wrong. A few years ago, it was one of the hottest real estate markets in the country; today it is the foreclosure capital of America. Developers started turning asparagus fields into subdivisions, and lenders handed out free money to anyone who wanted to buy. The lucrative construction industry borrowed jobs from the farm land. Unemployment followed when there was no longer development. Crime went higher made Stockton the second most miserable place to live in the nation. Among the three worst cities in terms of both unemployment and violent crime, only Detroit rank higher according to Forbes. Stockton became the microcosm of the unfortunate collapse failure of the real estate market in the nation. The brokers traded the loan away as market declined. The easy borrowed money exceeded home value called negative equity. It became so bad that the homeowners did not know who were holding the title of their owned home. There is no doubt that among the home owners are Filipino Americans. They too at times lost direction of Filipino American history. It is still sad that Frank R Perez, a great storyteller at the age of 94 would no longer be able to tell the Asparagus story in the valleys of California. He died two weeks ago. He was the dean of Filipino American journalism. I like to believe that there are still asparagus patches around the troubled real estate in Stockton. You will still find small Asparagus farm in the Garden State, New Jersey but not in Jersey City. Every time I see Asparagus in Jersey City (only in the produce department) it reminds me of good old days of our Manong. Notice that they are always delicately cut in uniform and neatly bundled, they will stand. The best way to cook is the same way, standing straight up, simmered to the delicious tops. They are the labor of love, taste of our history. Home ownership is part of immigrant’s dream but it began with the Asparagus. 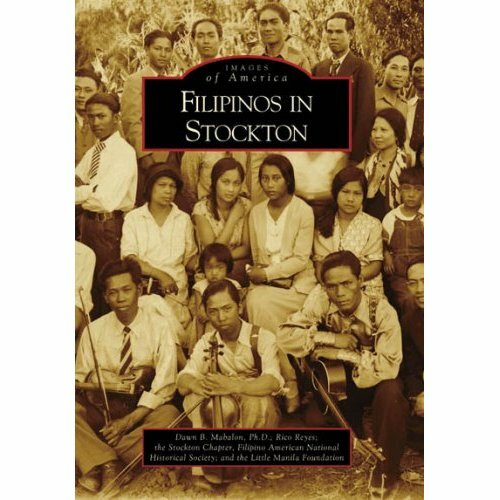 Downtown Stockton houses the early Filipino American experience. Filipino American National Historical Society’s Stockton chapter is working to save and restore what is left of the historical area, the Emerald Restaurant, the Rizal Social Club and the Hotel Mariposa on Lafayette Street. The Manong survived around the sign “no Filipinos allowed” and found retreat to stretch their backs from the asparagus field. National Trust for Historic Preservation named Little Manila one of America's 11 most-endangered historic places. The area is in the midst of foreclosure before the current housing crisis and revitalization of our past that need our support. We're launching our capital campaign and hopefully getting corporations and families ... to really contribute to the revitalization of Little Manila," said Dawn Mabalon, chairwoman of the Little Manila Foundation, Mabalon family are deep rooted in the asparagus farms in Stockton. Bundled as the Filipino American museum, the 2 million Pinoy have staked of collective ownership. A contribution to Little Manila project as little as the cost of a small bundle of asparagus is needed to pay for a share of home entitlement and virtual place of history.